By Friedmut Abel & Otsile Malebaco. 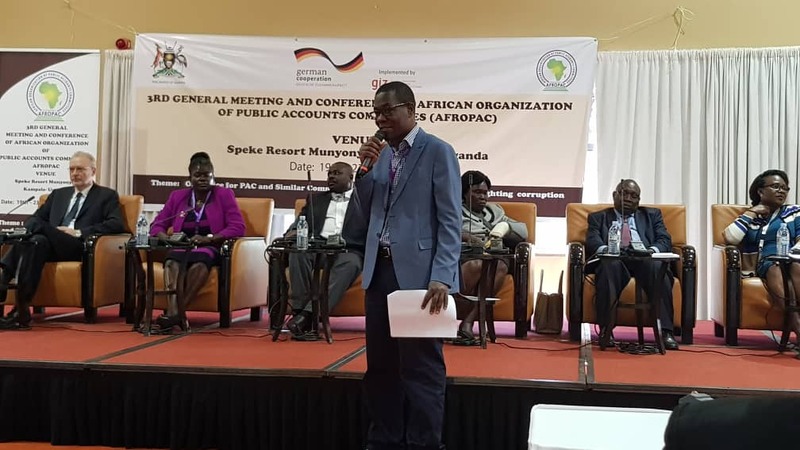 The African Organisation of Public Accounts Committees (AFROPAC) hosted its 3rd Conference under the theme “One Voice for African PACs on Managing Debts and Fighting Corruption”, hosted by the Parliament of the Republic of Uganda and supported by GIZ’s Good Financial Governance in Africa Programme. Vivid discussions and innovative ideas were shared amongst more than 200 conference attendees, leading to the formulation of the “Kampala Declaration on Fighting Corruption, Illicit Financial Flows and Managing Debt” in which legislators in Africa commit to strengthening parliamentary oversight on public debt and to promote the mobilisation of domestic resources in order to reduce the need for external debt. The Conference was officially opened by Rt. Hon. Jacob Oulanyah, Deputy Speaker of the Parliament of Uganda with welcome remarks from Hon. Angelline Osegge, Acting Chairperson of AFROPAC and Christian Schnurre, Country Director of GIZ Uganda among others. Hon. Augustine Ruzindana, the founder of Transparency International Uganda, explained that corruption is both a source and facilitator of illicit financial flows (IFF) and Hon. Fortune Charumbira, Vice President of the Pan African Parliament, encouraged stronger parliamentary involvement in overseeing the management of public debt. Discussions on anti-corruption and public debt examined the role of parliamentary budget oversight committees in fighting corruption, by strengthening accountability systems and increasing the mandate of parliamentary oversight committees. The second day of the Conference included various discussions on three thematic corridors, namely: Anti-Corruption, Debt Management, and the nexus Corruption-Debt-IFF. Presentations were made by The African Union Advisory Board on Corruption (AUABC), the African Parliamentarians’ Network Against Corruption (APNAC), the African Forum and Network on Debt and Development (AFRODAD), Tax Justice Network (TJN), the International Monetary Fund (IMF), the African Organisation of Supreme Audit Institutions (AFROSAI), the Tax Administration Forum (ATAF), the Auditor General of Kenya, GIZ and more. The discussions on these contributions were captured and included into the Kampala Declaration, which was signed and adopted at the 3rd General Meeting of AFROPAC, which took place subsequent to the two-day Conference in Kampala. The Declaration encourages the use of parliamentary oversight powers to establish strong accountability on debt. To tackle IFF and to manage debt in Africa, which has major risks for sound and developmental Public Finance Management, African national parliaments and their Public Accounts Committees (PACs) should work together in strengthening and improving the parliamentary process in fighting corruption both across the continent and with all relevant stakeholders at national and local levels. The General Meeting also discussed and adopted the newly developed vision and mission of AFROPAC. The latter is to deliver “One Voice of African PACs, similar committees, and regional PAC networks through advocacy, synergies, capacity building, and research, to ensure accountability and good governance for the well-being of our people”. Also, the Strategic Plan 2018-2023, as well as the Operational Plan for 2019, were discussed and adopted by the delegates. Secretary-General Hon. James Opiyo Wandayi also presented a Status Report and the financial accounts. The Conference and General Meeting was attended by representatives from 16 African legislatures and oversight stakeholders, including regional networks of Public Accounts Committees (PAC), Supreme Audit Institutions, representatives from Finance Ministries, Anti-Corruption Agencies, Civil Society and Development Agencies. The Speaker of the Parliament of Uganda, Rt. Hon. Rebecca Kadaga, closed the General Meeting officially while urging legislators of oversight committees to form strong accountability alliances for sustainable development and to never again succumb to corruption.